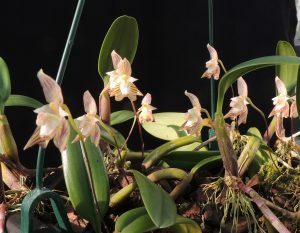 Bulbophyllum ambrosia is one of our most fragrant orchids with a wonderful scent of sweet warm honey. As you can see from the photos this is a a very pretty species that produces masses of single flowers on very thin stems so that they appear to float around the plant. 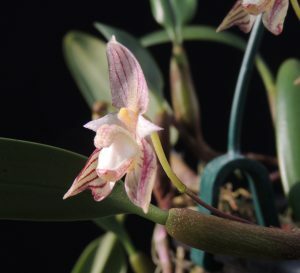 The species is native to Southern China and Vietnam where it grows in lowland evergreen forest, and we find it does well in our Warm Asia section kept shaded, and watered, throughout the year. 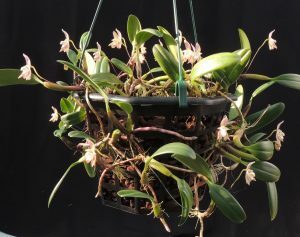 The species has a potentially straggly growth habit with a few cm between each bulb and so it is well suited to a basket of open bark mix where it can be tied back into the basket as it grows and eventually form a ball covered in flowers. This plant is already looking fantastic and in years to come will become more and more covered in flowers. The flowers themselves are long lasting, especially if water is kept off them, and the plant is very attractive when not in flower with its long thin pseudobulbs and glossy leaves.